Work It Wednesday | Sweet Cats! Disclaimer: This post may contain affiliate links. Making purchases/clicking may help support this blog. Happy Wednesday! This week has gotten off to an interesting start. Sunday night and early Monday morning, Houston and the surrounding areas flooded, so Monday I worked from home. Fortunately, it wasn’t terrible in the area I live in, but I have teacher friends who may not be able to go to work at all this week- yikes! We are expecting more rain this week, so please keep Houston and the surrounding areas in your prayers! For those of you who are a bit confused by the title of this blog post, let me explain. My last year of college, I was obsessed with going to the gym. I went every day and it became my favorite pastime, stress relief, and way to avoid homework. I was convinced that it would be a lasting habit. Well, then I started working full time and no longer had the spacious, free rec center filled with courteous individuals, and working out got to be really difficult. After searching for a gym with an indoor track for weeks, I found none. I refused to use the treadmill in my apartment and after a few weeks without doing my ab circuit or lifting weights, I started to notice a change in my appearance, my energy level, and my mood. So I hastily bought a membership to what I deemed the best replacement, a large local gym that was affordable and close to my office. And I hated it. It was so crowded at 6 pm that I rarely was able to finish a workout. People were rude and literally told me I was in their way. And don’t get me started on the creepy men that stared all the time. I missed the rec center, the indoor track, and boys that didn’t make me feel uncomfortable. Sometimes I cried about it, not a joke. I toughed it out for a while, but ended up going to the gym only once or twice a week. I tried Pure Barre but I decided it was for wimps (sorry if you like, love it.). I was so frustrated with how my level of fitness had fallen in the past few months, but I didn’t know what to do. I was tired of paying for a gym I didn’t use, but I didn’t want to have zero options. My mom had been suggesting for months that I try to find workout videos and use the gym in my apartment complex. I kept telling her that workout videos were for wimpy girls and I only liked to run on the actual ground and lift real weights, so no thank you. But out of desperation, I started searching one day, and came across the Nike Training Club app. I was skeptical, but I perused the workouts and they looked really great! They incorporated cardio and strength training which was perfect. So I did it. I quit the gym. No more monthly fees, no more frustration over unfinished workouts, no more excuses for not getting a workout in. Find a program you love. Whether it’s the Nike Training Club, Blogilates, or a routine from a personal trainer, the possibilities are endless! Actually, since I have someone telling me what to do, I’ve noticed more consistent results, as opposed to when I would just wander around the weight room and say, “oh this looks like something I can do without embarrassing myself!”. Switch it up when you get bored, that’s the beauty of quitting the gym! Invest in equipment. You’ll have to choose your program first, but I would suggest starting with a yoga mat and a pair of hand weights at the very least. I use the mat for all floor exercises, and the hand weights for a variety of exercises, like lunges, arm presses, and abs. You can expand into a medicine ball and resistance bands, too! At first, I didn’t want to spend the money on these things, but compared to a gym membership it’s pretty reasonable. Plus, they do not have to be expensive- both of mine are from Marshall’s! Use your resources. Earlier I mentioned that I did not want to use the treadmill in my apartment complex. Well. I had to get over that. Obviously, I can’t go for a run inside my apartment. If your apartment complex has a treadmill, use it-you pay for it! I only use it when it rains or when I want a quick run, because I feel like a hamster on treadmills. I found a small neighborhood behind my apartment complex that I’ve been running through when the weather is nice. It’s full of old people, so it seems pretty safe. But always be mindful of your surroundings! Do not stop with the coordinated workout outfits. Hi, sometimes the only reason I could convince myself to go to the gym was by wearing my LuluLemon tights. Not a joke. So I still like to look cutie, even if I’m by myself. Break it up. If you can’t stand the thought of working out at home all the time, consider attending a workout class once a week or so. Stick to it. It can be difficult to keep yourself accountable to a workout plan when you can literally walk two steps and plant yourself on the couch for the evening. But if I can do it, so can you! I like to make it a challenge for myself. I never turn on the TV until I’ve finished my workout. I also like to have a set time to start. I come home, eat a snack and am ready to go at 5:45. Trying to get back into the routine is extremely difficult, but once you’re used to it again, you start looking forward to it! So there you have it. Did I convince you to quit the gym? It’s definitely easier than I thought! I don’t think this will be a forever fitness routine for me, but it’s working right now! Do you exercise at home or go to a gym? Which do you prefer? Let me know! Happy Wednesday! You know what that means- we’ve made it halfway through the week! It also means WorkIt Wednesday is back. I’m going to be honest, I have not been working it lately. I’ve just been super tired and not feeling like going to the gym, and I haven’t been eating very well. But, it’s time to get back on track! I’ve fallen off the wagon quite a few times in my day, and I’ve found that the easiest way to get back on is to start at the beginning (breakfast) and work up from there. I usually just eat Greek yogurt for breakfast, but sometimes that gets boring, and I get REALLY hungry/hangry at around 10 am, leading me to break into my lunch at the first acceptable moment (11 am), which means I’m starving again by 5, and come home and eat everything I see. Which is obviously incongruent to my goals. After seeing these on Pinterest, I decided to make my own version of a protein-packed breakfast bowl. I’ve made a few different varieties, and have devised a simple 3-step formula for the perfect bowl. 1. Base-start with a single-serving cup of your favorite flavor of yogurt. I usually use coconut Chobani, but they were out, so I settled for plain. Sometimes I will mix a tablespoon of peanut butter in with the yogurt to add a little extra protein and flavor! 2. Make it sweet- For me, this is a drizzle of honey, but you could use agave nectar, stevia, or just leave it plain if you’re using a flavored yogurt. 3. 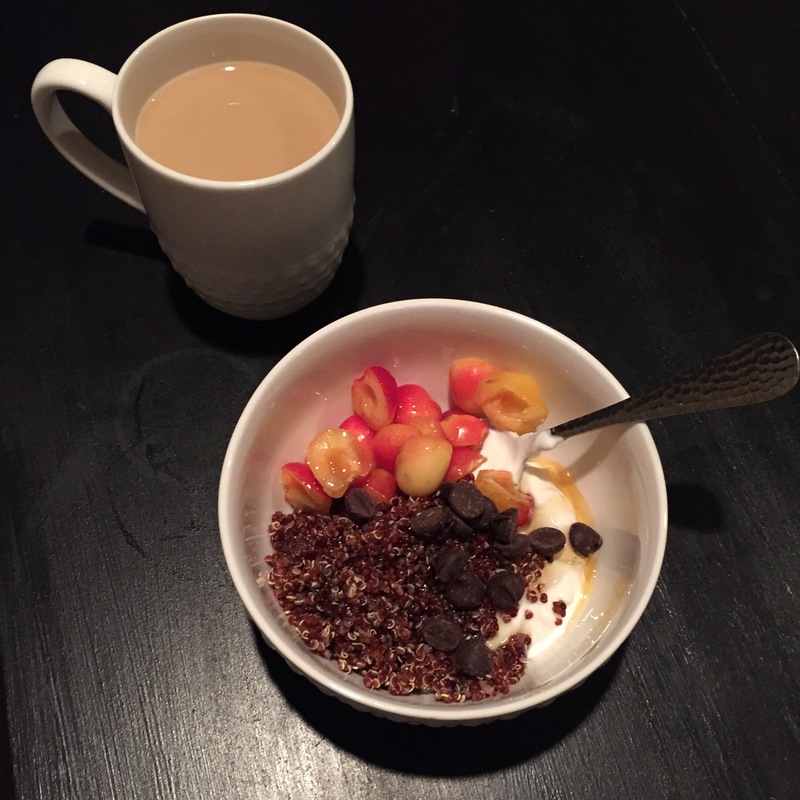 Add the extras-I usually add 1/4 cup of quinoa and some type of fruit, but you could add nuts, granola, or even chocolate chips to make it interesting! If you come up with a new combo, let me know- I would love to try it! This is an easy way to have a healthy breakfast to help you power through your day, and it’s completely flexible to accommodate your tastes. It’s Hump Day! And this week’s Pre-Friday since it’s a short week for most of us. And it’s payday, which is exciting but we’re not going to talk about how I’ve already spent 1/4 of my July shopping budget online at JCrew Factory last night, but we will talk about how all of the clearance was an extra 50% off and I got some great deals, so it’s not thaaaaat bad. Anyways, WorkIt Wednesday is a (not-so-regular) series where I like to share my tips and tidbits that help me personally live a healthier lifestyle, in hopes that it helps you, too! 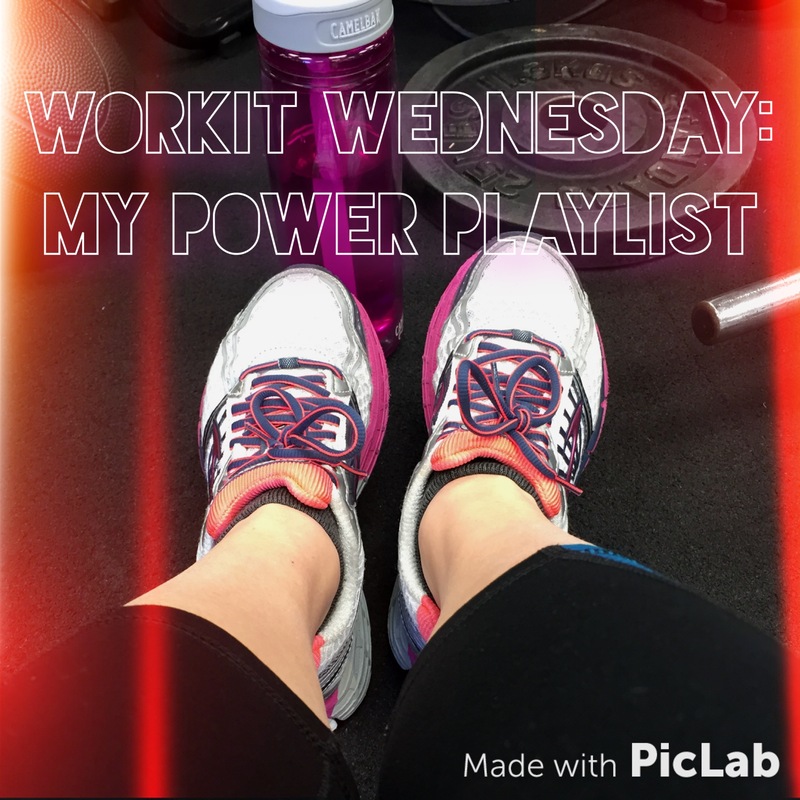 Today, I’m sharing one of my favorite workout playlists. You may remember my Power Playlist from a few months back. That’s what I listen to when I’m really needing some motivation to get through my ab circuit. However, sometimes I’m just not in the mood for pop music- I want something a little calmer, but still upbeat. I love country music in general, but a lot of it is too slow to listen to while I work out..it doesn’t really keep me moving. Recently, I’ve put together a few of my favorite country songs that help me keep the pace! An easy way to shake up your workout is just change your music! If you’re a country music fan like me and are wanting a bit of a different sound for your afternoon treadmill trot, give this playlist a try and let me know how you like it! 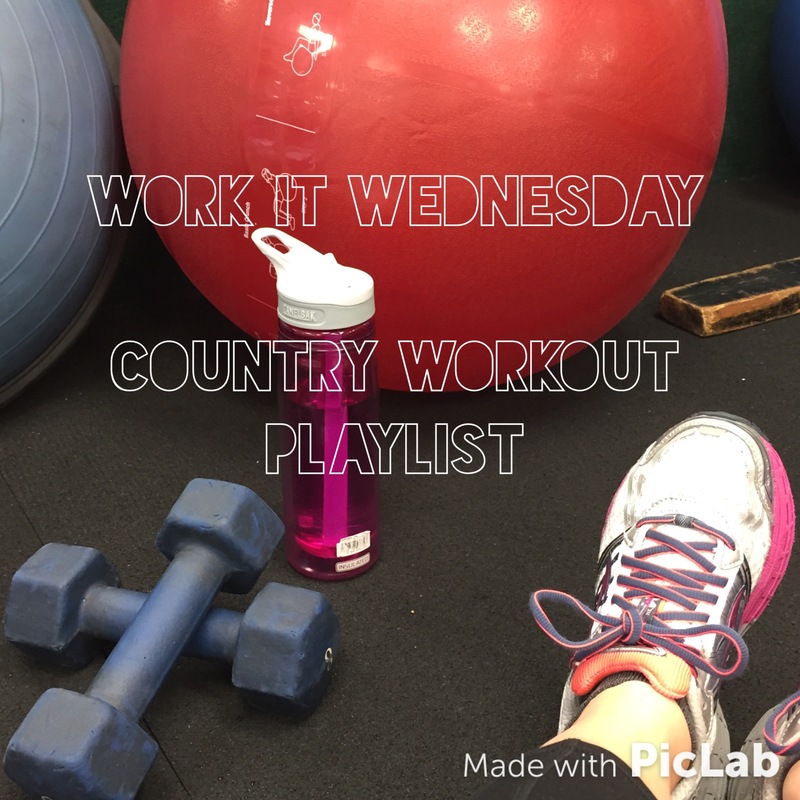 WorkIt Wednesday- Get Out of My Face. As we speak, I’m catching up on The Bachelor, since it’s during my sorority meetings on Monday nights. It’s only been about ten minutes, but all I have to say is that these girls are super trashy. I’m not even sorry, and if it turns out like Juan Pablo’s season I may have to stop watching. I mean, that’s probably an empty threat, but please class it up, ladies. I digress. Today on WorkIt Wednesday, we’re going to talk about my hair. And a little bit about yours, but mostly mine. I like to believe that I have really nice hair, and I like to wear it down most of the time. However, there is nothing more annoying than having it all in your face when you’re trying to be active. For eample, when I was a cheerleader, we would sometimes wear our hair down and straight to basketball games, because you know, everyone cared about how we looked standing in the corner squealing and dodging referees. I just remember a few times where I threw tumbling passes and thought I was going to DIE because my hair whipped over my eyes and I couldn’t see which way was up and everything was moving so fast. Ever since then, I’ve been a little judgy when I see girls with their hair down at the gym. I mean, your hair looks great, but does it not inhibit your workout? Maybe it’s just me, but I like my gym hair like I like anyone’s sass but my own- out of my face. I get it. Sometimes it’s Day 1, and you don’t want a ponytail bump or headband crease. On these days, I’ll just pull my hair back with an extra stretchy hair elastic, like these from Ulta. I like these because they don’t give me a ponytail bump, and they hold pretty well, too. Sometimes I leave it at a ponytail, but other times I need a headband so the wispies don’t get in my way. I’ll wear a loose-fitting, cloth headband so my hair doesn’t get too greasy, and so I don’t get a headband crease! 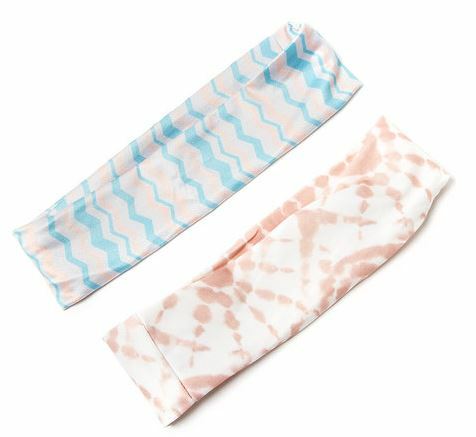 I have a similar pair of headwraps from Icing, and they’re great for keeping your hair out of the way but still allowing you to wear it down the next day! This is when you’re going to wash your hair before you have to look presentable again. 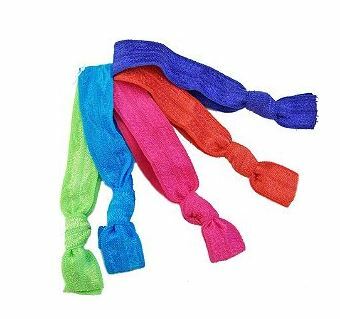 I usually use one of the hair ties above, and pull my hair back with a thin headband. 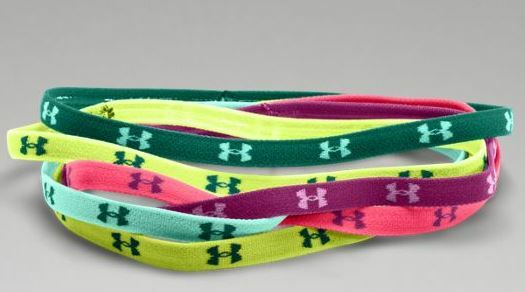 These from Under Armour are my favorites, because they have grips on the reverse side that keep them from sliding down your face while you’re running, because that poses a real problem. This typically occurs on a Saturday, when you definitely should have washed your hair the night before, but you either went out or you just didn’t feel like it, and your hair is greasy and beyond ratchet. The only option for this day? Put on a hat and cover that mess up. This is also a good option for when you don’t want to talk to anyone: just pull the brim down low enough and go on about your day. 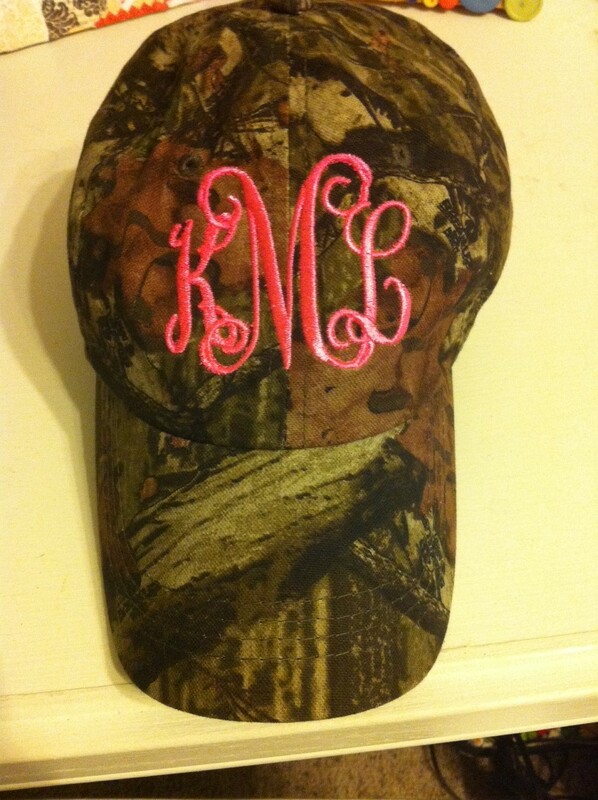 I have quite a few hats that I wear, mostly with a Texas A&M logo, but my favorite is my monogrammed camo hat from Mandy’s Monograms. It says “I’m pretty cute, but I’m also not messing around”. So there you have it. Multiple ways to keep your luscious locks out of your face whilst breaking a sweat. Now that I’ve shared this with you, you have no reason to be “that girl” whose hair is the only thing getting a workout. Learn it, love it, live it. And it’s Wednesday, so don’t forget to #werkIt. I’m back in Aggieland! I drove in yesterday, so I could get back into the swing of things and work a little before school starts on Monday. I cannot believe it’s my last semester of college! I feel like my parents just left me at my dorm as a freshman…but that’s a sappy blog post for another day. Anyways, I was supposed to go to the grocery store when I got in yesterday afternoon, but after unloading my car and seeing that unpacking was going to be quite the task, I decided to get Chipotle and watch The Bachelor with my roommates instead. (also I’m actually terrified of Ashley S. That is all.) So I get to go after work today-yay! If there’s one thing I’ve learned from adopting a healthy lifestyle, it’s that exercise definitely gives you results, but eating right is crucial to looking and feeling better. You know that saying “when you eat crap, you feel like crap”? It’s true. Growing up I hated vegetables and looooooved junk food. My mom always made healthy meals and limited my junk food intake, but I still would have rather had ice cream as opposed to an apple. When I first got to college, I had really bad eating habits when I was living in the dorm. They improved a bit once I moved off-campus and had a kitchen, but my idea of a balanced meal was chicken, rice, and some frozen corn I zapped in the microwave. Okay, but not the best. Over the summer, I started trying new recipes I would find on Pinterest, or get from my sister, and started to cut down on processed food and snacks like chips, crackers, and sweets. I felt so much better, and I know it’s because I was putting good fuel into my body. Unfortunately, I got a little off track over Christmas break, but tomorrow’s grocery store trip should help! Here is my shopping list to prepare for the semester- since I didn’t go today, it’s tentative, but if I pick up something extra, I’ll be sure to add it! I know this list seems a little short, and you probably are thinking I’m crazy specific with my meals. But, I have some staples on hand, and plan on mixing things up! A lot of the items under “Lunch” will definitely be used for dinner as well, and I usually eat fruit or popcorn that I already have for snacks, which is why that section is so small! However, if you’re wanting to start healthy eating habits, this is a good list to work off of! 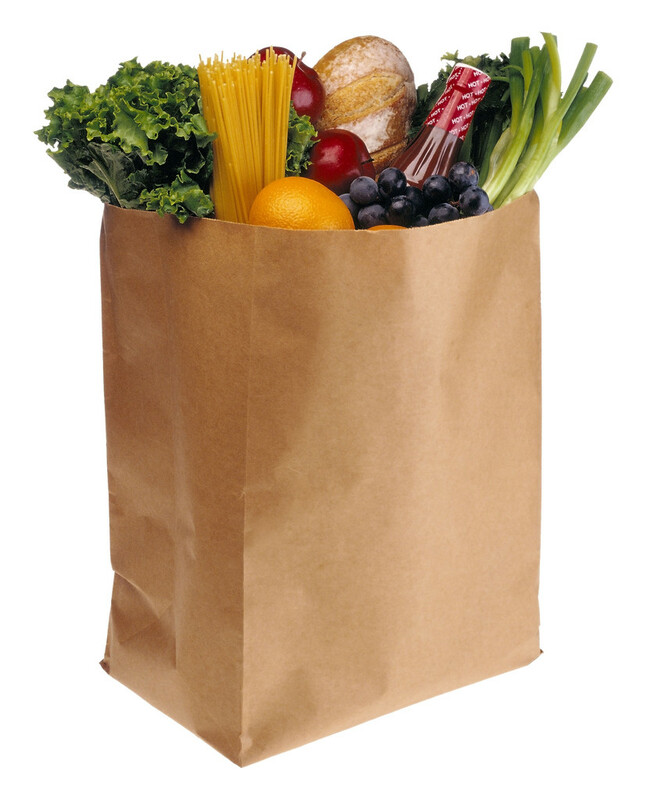 What’s on your healthy grocery list? Let me know! Each semester when I come home, I have one week that’s filled with doctor’s appointments, and that week is upon us. With the exception of the eye doctor (HATE that puff of air business, and I can’t tell you the last time I could read the smallest line- like, face it, I’m blind, just adjust my prescription and “oh I have to drive myself home, I can’t get my eyes dilated today SARS”), I actually don’t mind all of these appointments- it gives me something to do with my time. My favorite is the dentist appointment, mainly because I’ve had the same hygienist since I was in high school, and we’re besties. She loves to ask me all about my life, and I love to tell her in between teeth scrapings. All I want is for everyone to be as excited to see me as my dental hygienist is every six months. I digress. Also, remember WorkIt Wednesdays? Yeah, I barely remember them myself. It was supposed to be a weekly series on fitness and a healthy lifestyle. Oops. The good thing is, I kept going to the gym! Until I came home for Christmas and just found my way to the track only yesterday. Oops again. But it definitely felt good to start getting back into my same routine! I like to go to the gym by myself- it’s really great “me time”, a luxury I require large doses of. Very large. However, since I’m by myself, I need music to keep me entertained and motivated, and to drown out the girl talking on her phone whilst walking on the track. Depending on how I’m feeling and what I’m doing, I have a few different playlists for my workouts. Today, I’m going to share my all-time fave, The Power Playlist. This is what I’m listening to most days, but especially while I’m in the weight room, or when I’m feeling extra energetic. Also, disclaimer: my taste in music is a little lame, so please don’t laugh. But I’m hoping that you will find a few new tunes (or old faves) to add to your workout playlist! 1. Boom Clap by Charli XCX- this is great for warming up and stretching, and sometimes the first walking lap around the track. 2. Fancy by Iggy Azalea– A personal fave for the transition from walking to running. It makes me feel like the hair flip emoji girl. Except I’m not in the fast lane, I’m def in the “slow jog” lane. 3. I Can Transform Ya by Chris Brown– Old, but this was in my Songfest routine, and I’ve always loved it. This is for when you hit your stride. 4. Yeah! by Usher– For obvious reasons. 5. Break the Rules by Charli XCX- this is for when the track is crowded and you have to be a little rude and break through that group of girls walking four abreast. MOVE PLZ. 6. Survivor by Destiny’s Child– for when you thought it would be over by now but it WON’T STOP and you have 3/4 lap left. 7. Come & Get It by Selena Gomez- for your water break in between running and the weight room. 9. Started From the Bottom by Drake– for when you’re adding a little more weight to the seated row machine, or when you want to pretend to be a university athlete. 10.Hollaback Girl by Gwen Stefani– for when all the ab mats are occupied and some jerk is laying down scrolling through Instagram. B-A-N-A-N-A-S.
11. Piece of Me by Britney Spears– rounds 1-2 of abs. Do you want a piece of me and this medicine ball? That’s what I thought. 12. Work B**ch by Britney Spears- for the extra set you’ve talked yourself into, because if Britney says keep going, you keep going. What are some of your favorite songs to sweat to? Let me know! Happy Wednesday! This week has been busy, but not nearly as crazy as last week, which is a relief! I only have one test tomorrow, and then it’s smooth sailing until I go home on Friday! Also, I have been trying to write this post for actual weeks, but life keeps happening and I get distracted, and it keeps getting pushed back to the next week. Which is why I’m writing it now, when I should be studying for my test. Obviously. So, I’m excited to finally introduce to you a new blog series…Work It Wednesday! Working out and living a healthy lifestyle has become something that’s very important to me lately, so I’ve decided to start sharing some tips, tricks, recipes, and other information for healthy living on a college-girl budget and schedule. That being said, I am not a doctor, registered dietitian, or any other type of healthcare professional- I am simply a 22-year old with a gym membership and a kitchen sharing what works for me, so please don’t take my words as Gospel truth. This week, I’m starting with one of my favorite things about going to the gym- workout clothes. I’m not going to lie, sometimes the only reason I go is so I can wear my workout clothes…whatever works, right? I think they’re just as cute as real clothes, and have gained quite the workout wardrobe over the summer. However, I have a hard time spending a lot of money on gym clothes- I’m just going to sweat in them, and I could easily wear one of the six thousand sorority tees I have in my drawer. Luckily, I’ve been able to find great deals on all of my activewear- you just have to know where to look! Duh. Old Navy is my favorite place for basically anything, including activewear. They have the BEST deals, and there’s always something on sale. 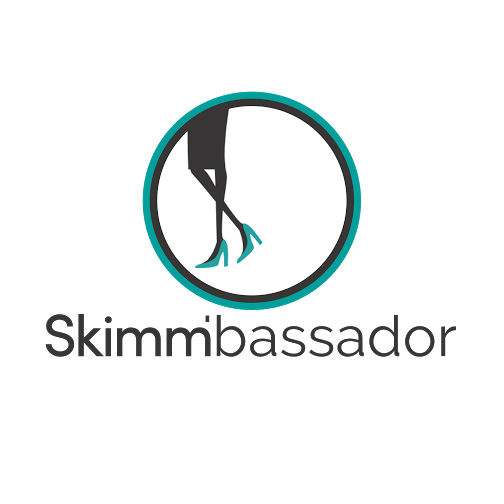 This is my favorite place to shop for leggings, because they’re great quality and you can typically find them on sale for under $20. I’ve also found a few of my favorite tanks here, including this one that I scored for $6! If you’re willing to dig through racks of clothes (which is rare for me), you can find some great deals at TJMaxx. I found my favorite tank and sports bra here a few weeks ago! Target is a great place for tanks, sports bras, and sometimes leggings. They have pretty low prices even when it’s not on sale, and it’s usually good quality! As you can see from my examples, I prefer flowy tanks and leggings, and usually in black, with the exception of a few bright-colored tanks. I think that’s the most comfortable, but depending on what you’re doing that may change! 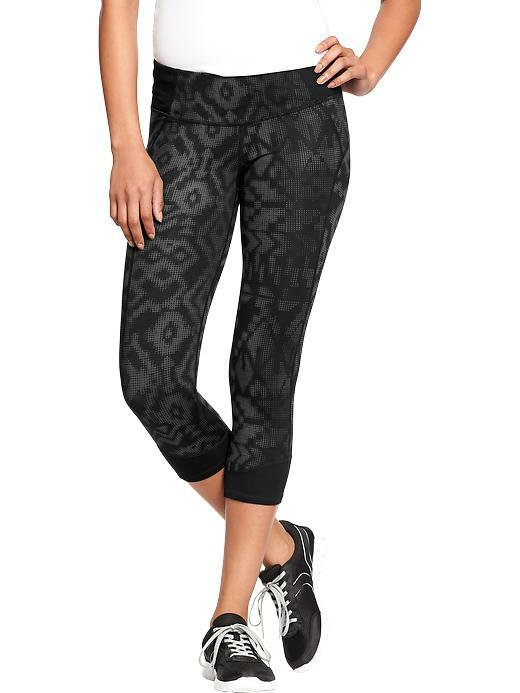 What’s your favorite brand of activewear? Let me know!